During the webinar, experts from the private, non-profit and philanthropic sectors explored the nature of some of the work the private sector is undertaking to address gender norms; address some myths and misperceptions concerning private sector involvement in women’s economic empowerment and gender norm shifting; and highlight opportunities and ways forward for the greater engagement of the private sector in shifting gender norms, as well as greater understanding of and collaboration between the development and the private sectors. 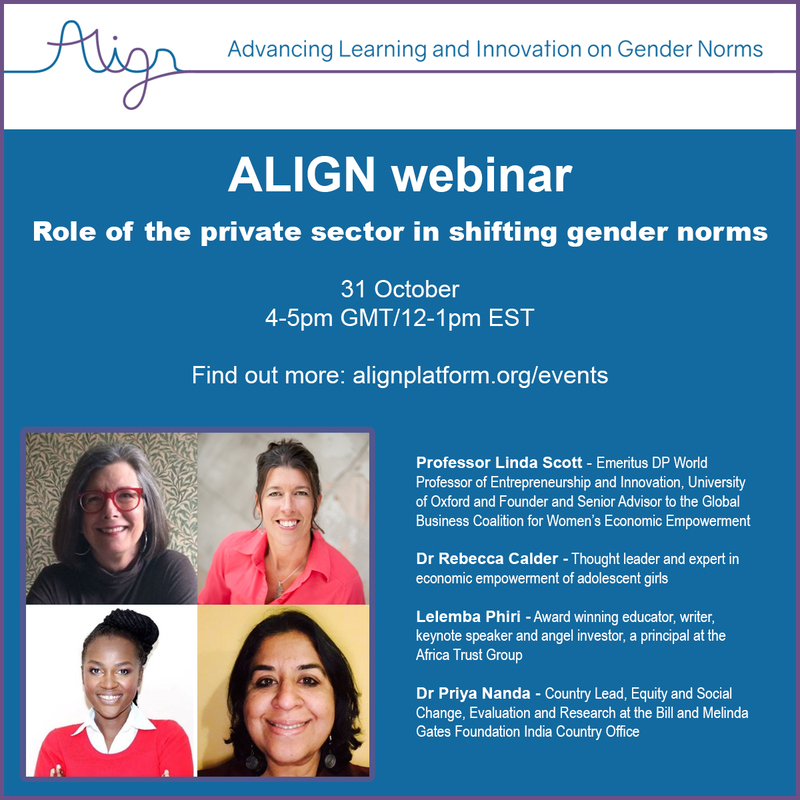 This webinar highlighted the findings from the recently published ALIGN report "Private sector involvement in development: What impact on gender norms?". What are the characteristics of a successful mentoring program that shift gender norms? Social norms are behavioral rules constructed and shared by a group, and are different from individually-held beliefs or attitudes, so we would not expect a mentoring programme on its own to shift gender norms. However, a programme where women come together to discuss and debate issues could contribute to norm shifting. Because social norms are comprised by one’s beliefs about what others do – “empirical expectations”- and by one’s beliefs about what others think one should do -“normative expectations” - then understanding what behaviours are common (rather than just relying on beliefs about behaviours), as well as hearing what others’ expectations actually are (rather than relying on one's beliefs) could contribute to norm change. Even more powerful is to have these discussions in mixed groups with women and their husbands or with women and their mothers-in-law, for example. For norms to be shifted, it is important to engage with those in a woman's reference group, which is defined as group that individuals use as a standard for evaluating themselves and their own behaviour. Strengthening women's sense of agency is also a contributor to women not complying with social norms, so mentoring could support that. In contexts where domestic violence is rife, how do you work with husbands to address gender norms and boost women’s economic empowerment? Rachel Marcus and Caroline Harper's review suggests that fear of sexual and gender-based violence significantly constrains women’s economic activity. Of interest is that the two quantitative studies she reviewed that used DHS data to examine whether women’s increased labour force activity is associated with increased intimate partner violence (IPV) found a clear relationship only in Latin America and East Africa, and for women working in agriculture. This suggests that the hypothesis that IPV is rising in response to (or backlash against) gender norm change needs some further thinking. Also important to note is that violent behaviours, such as IPV, may not necessarily be supported by social norms, i.e. there may not be social expectations that a man hits his wife, and husbands may not sanction another man for refusing to do so. However, where IPV is highly prevalent, evidence suggests that there are other social norms underpinning this behaviour, for example around gender roles, power and the wider acceptability of violence that contribute to shared expectations around a man’s use of violence. Thus, it is important to look more widely and examine norms related to, for example, masculinity. Both CARE and Promundo have used husband/wife trainings to reduce gender-based violence in women's savings groups programs. View resource by Promundo. What advice do you have to navigate the moral question about pushing for social norm change as an outsider? Like with so much of what we do in global development work, it is important to collaborate with local, grassroots activists and social justice organisations that are working to tackle discriminatory and harmful norms. These leaders can help design locally-relevant, context-specific interventions and arguments, highlighting, for example, where gender norms may violate women's human rights, or where they are contrary to/out of step with wider legal and policy frameworks. Private sector initiatives often focus on women’s economic empowerment, partly because this can be achieved within a 2-3 year project and can be easily measured. Does the panel have any examples of where companies have invested in changing gender norms (apart from PACE) and how has this been measured in a way which speaks meaningfully to businesses? Rebecca Calder’s paper, Private sector involvement in development: What impact on gender norms? provides examples from diverse industries including KadAfrica (farming), Zoona (mobile money transfers) and Paritran (security). There are likely many more great examples; please contact us if you want us to know about yours. Professor Scott argues that women’s economic empowerment is a change in gender norms. This is true everywhere, but especially in places where women are not supposed to have their own money. In situations like that, the simple act of opening a bank account is a serious challenge to gender norms and thus requires steps like planning for GBV that may occur in response. It is also important to note that women’s economic empowerment is a long-term proposition. While a single intervention may be completed within a 2-3 year time frame, the achievement of economic empowerment takes much longer, even decades. Finally, measuring women’s economic empowerment is not easy. Many private and public institutions are trying to design and test measures that will capture when a woman is actually “empowered” economically. Just counting how many women are trained or how many get mobile phones ignores the gender barriers that must be dealt with deliberately in both design and measurement. For instance, a woman may enroll in an entrepreneurship training program, but be unable to complete it because her husband withdraws permission. Or, she may complete it, but be unable to act on the knowledge because she has been denied access to capital. She may get a mobile phone and then have it taken away. Traditional gender norms have many ways to perpetuate mistreatment. When designing interventions, teams should anticipate the blocks a woman might face and insert measurements that can pick up problems as well as achievements. What are the most urgent gender-based risks and opportunities from a business perspective that overlap with leading gender-based humanitarian/social efforts? The business and humanitarian sectors share a pressing need for women’s safety to be guaranteed. Women face attacks on commutes and in the marketplace, even in banks and with customers, not to mention at home. The private sector is normally limited to specific workspaces in its ability to protect women, but it recognizes that women need to be safe if they are to engage fully in the economy. Business necessarily looks to government and humanitarian groups to take the lead on this issue, but should be standing by to assist wherever possible and appropriate. Women’s safety is important for everyone. Which industries (besides textiles) are ripe for private sector engagement when it comes to gender sensitive initiatives and policies? As noted above, diverse industries, including the agricultural, financial and security industries, have begun to tackle gender norms. We don’t believe there is any industry that is not ripe for becoming more gender-sensitive. Have you observed any attempts to include women with disabilities in these initiatives, and if yes any ideas of factors of success/failures? Unfortunately, we’re not aware of any such initiatives in low and middle-income settings, but we are eager to learn more, so if you have examples to share, please do. Report: Private sector involvement in development: What impact on gender norms?